The Leica Disto E7500i is designed as a successor to the Disto D5. Maybe, you manage to find a Disto D5 still on a shelf. The operating concept is modern and inspired by the logic operation of mobile phones. Because of the huge amount of Disto E7500i’s features the ease of use is an important point. Who wants to consult the instruction manual before more complex measurements? Therefore an intuitive menu is important. The E7500i inherits all innovative and useful features of the D5, makes it even better and brings up some additional ones. The main similarities between the two devices are the viewfinder with 4 x zoom and an integrated tilt sensor. The similarities are rather theoretical. In practice there are distinct differences: The viewfinder of the E7500i was improved compared with the D5. The Leica Disto E7500i is one of the few rangefinders that works well outdoor. What are the differences between the E7500i and the Disto D5? What are the advantages of this up-to-date rangefinder: Reaching IP 65 means the laser distance measurer is protected against water and is dust-proof. His inclination sensor measures the full range of 360 degrees. The D5 measures only inclinations between +/- 45 degrees. 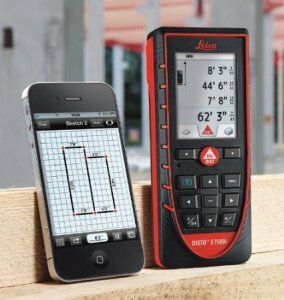 The E7500i has a Bluetooth interface that works together with Leica DISTO ™ sketch a free app for iPhone and iPad as well as for Android phones or tablets. The app can transmit the measured data error-free. 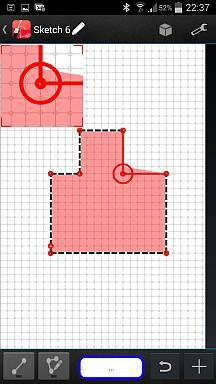 You can create floor plan sketches and tables and even photos can be modified with distances. The Leica DISTO ™ E7500i has a 360 ° tilt sensor. 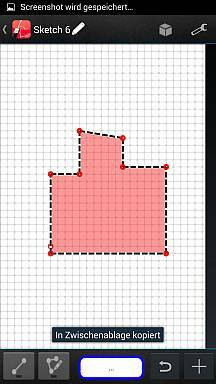 You can not only measure angles, but also horizontal distances. That allows together with the viewfinder indirect measurement methods which can be very useful. It is possible, for example, to measure in bright light where the reflective point for targeting is not visible. This laser range finder supports you to determine the height of a reflecting wall, or of trees. With other recent laser distance measuring devices such measurements are not possible. The tilt sensor also allows to measure height profiles by horizontal distances in a simple and rapid way and height differences are recorded. A tripod makes the distance measuring for long distances easier. The ISO 16331-1 standard for the accuracy of laser rangefinders is maintained. Thus, the E7500i is one of the most accurate laser range-finders. We did several tests against other laser distance meters. The result clearly showed that the precision and accuracy of ISO 16331-1 meters is higher and the standard deviation of multi measuring of the same distance is much smaller. 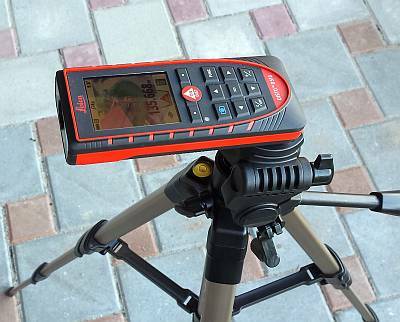 The Disto E7500i includes features that no other measurer, we tested laser rangefinder. 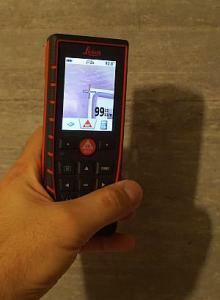 You can order the Leica Disto E7500i laser distance meter online for a competitive price. Feel free to compare this online-offer with your Leica partner’s price. Check Price and availability of the Leica Disto E7500i. 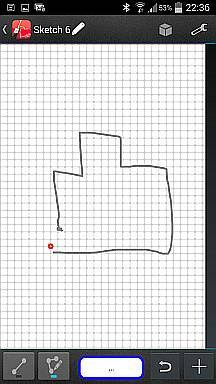 Use the touchpad to draw a sketch. Different units are possible. 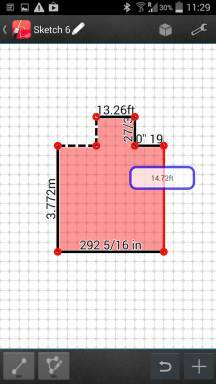 The app shows the unit of each measurement. 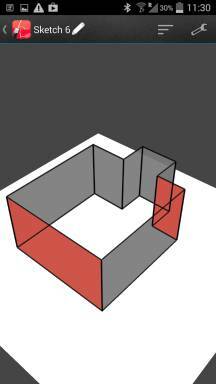 3D-floorplan. 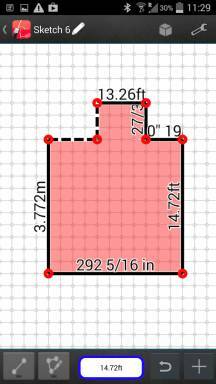 Now each wall can be measured similar to the floorplan.